Naries Namakwa Retreat | Can Do Can Go! Unfortunately, the whole concept of game-viewing lodges makes it pretty well impossible for them to cater for clients with any significant mobility problems, but Naries Namakwa Retreat is not a game-viewing lodge. It is aimed at the wilderness experience, although it does have quite a lot of birds and antelope freely roaming around its 6,000-hectare site. 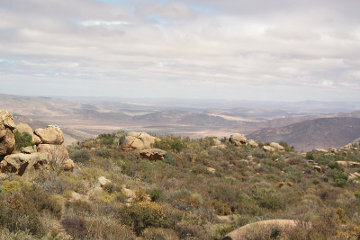 Situated to the west of Springbok, in the Northern Cape province of South Africa, it spreads back from a scarp dropping sharply to the plain leading to Kleinsee coastal diamond area, about 100 km away. On their first night, guests are driven (or can choose to walk or jog) about 1 km from the main house to a lookout point, where we drink champagne as we watch the sun go down. After sunset, we can see the twinkling lights of small private alluvial diamond mining companies, stretched along the road to the security-controlled main coastal area. Close to this viewpoint, also perched on the edge of the scarp, are three “Mountain Lodges”. The one we stayed in (the Honeymoon Suite) is not easily accessible, but the other two are. 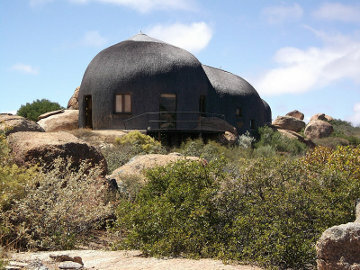 They are built to include existing rocks inside a boulder-shaped steel frame covered in thatch, based on bushman dwellings which use wattle frames. Inside, they are spacious and well-equipped, with spectacular wilderness views through the windows and from a deck reached via French windows. In August and September, Namaqualand bursts into flower. If you stay at Naries during this period, you’ll have brilliant colours extending right from your doorstep as far as the eye can see. The main house is spacious, and contains the restaurant, which serves superb food and wines. Having noticed that there was a way to avoid the small steps leading to the main entrance of the house, we asked the manageress whether she felt that they could accommodate guests with mobility problems. We were delighted to hear that they had accommodated a party of US forces veteran amputees the previous year, after which they had made changes so that it was now easier for wheelchair users to reach the swimming pool. Getting there is not easy. The nearest airport is Upington, 375 km away, but that’s about a four-hour drive through some beautiful wilderness country with very few vehicles in sight most of the time. Dinner, bed and breakfast varies from about £100 to £120 per person per night for double occupancy of the Mountain Suites, and £60 to £90 per person for double occupancy of a main house bedroom. In the UK, you’d be lucky to get a restaurant meal of the same quality for £60 a head. This entry was posted on Monday 12 December 2011 at 10:35	and is filed under Hotels in South Africa. You can follow any responses to this entry through the RSS 2.0 feed. You can leave a response, or trackback from your own site. Thanks for such a great article, Mike. We need more of this kind of info and would love if more people would get in touch with their findings.